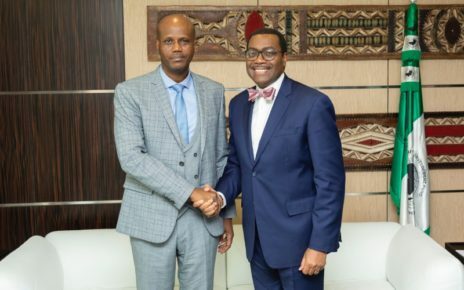 ARUSHA – East African Community Secretary General Liberat Mfumukeko has met with African Development Bank (AfDB) President and briefed him on the status of EAC integration highlighting the progress in the 4 pillars of integration and articulated the support needed from the Bank. Mfumukeko met Dr. Akinwumi Adesina on February 15 at the AfDB headquarters in Abidjan, Ivory Coast. The Secretary-General appreciated and acknowledged the great support provided by the Bank especially in the area of infrastructure and Financial Sector. In their discussion, the Secretary-General used the opportunity to seek support in the implementation of the 5th Development Strategy, which he said requires US$985 million over 5 years. He specifically sought support in Agriculture and Industry. The Secretary-General also requested support for the implementation of the EAC Heads of State approved infrastructure projects during their Retreat in Kampala, Uganda in February 2018. Mfumukeko informed the President that the EAC Heads of State approved a list of 286 Infrastructure Projects which are estimated to cost 78 billion to implement over a period of 10 years. On his part, the President of the AfDB appreciated the visit by the EAC Secretary General noting that EAC region is the most active and dynamic Regional Economic Bloc with very clear results and a very high level of political momentum. Dr. Adesina lauded EAC for the great gains made in the implementation of the Customs Union and the Common Market. He specifically noted the progress in free movement of people and increased trade. He noted that EAC Countries are now issuing the East African E-passport. The Bank committed to present EAC bankable projects to the AfDB coordinated African Investment Forum in November 2019 in South Africa. A joint team of EAC and AfDB will work on preparing bankable projects for presentation to that effect. The President was accompanied by the Vice President of the Bank, and Dr. Caleb Weggoro, the Executive Director responsible for East Africa, while Amb Mfumukeko was accompanied by the Chief de Cabinet and the Principal Resource Mobilization Officer.